Description Hand coloured steel engraving. Size 47cm x 40cm (19" x 16"). Shows 1.H.M.S. Rupert, twin screw harbour defence ship, 2.H.M.S. 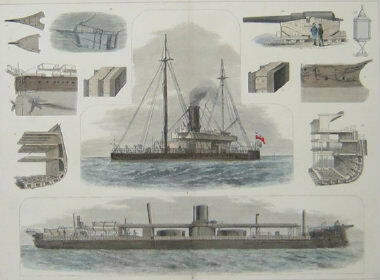 Monarch, sea going turret ship, 3.section of iron platting of H.M.S. Hercules, 4.do. of H.M.S. Thunderer, 5.stem of H.M.S. Hotspur, 6.stem of H.M.S. Bellerophon, from above, 7.stem of Bellerophon, in profile, 8.stern of Rupert, 9.cross-section of a ship of war, 10.section of H.M.S. Devastation, 11.81-ton gun, 12.Harvey's Torpedo, 13.bouyant submarine mine.